Today marks the third anniversary of the successful launch of our Stratos II+ rocket. 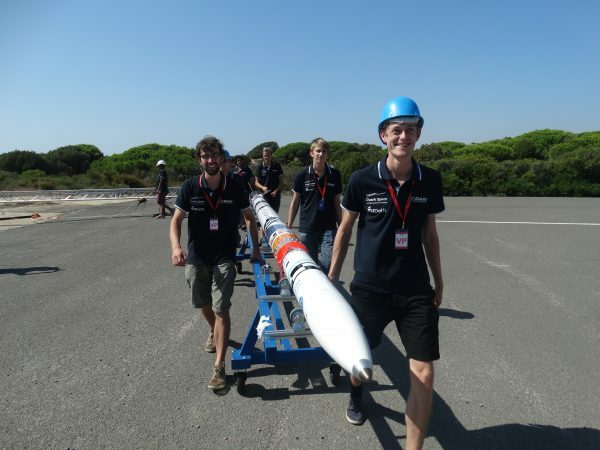 On October 16th 2015 Stratos II+ flew to an altitude on 21.5 km, thereby breaking the European altitude record for student rockets. This achievement was the culmination of many new technical innovations and operational successes which are still with us today. The DHX-200 Aurora hybrid rocket engine, which powered the Stratos II+ rocket, was the first of a successful generation of large hybrid rocket engines that have been developed by DARE. The constant development of this engine, helps us to extract more and more of its potential. The Stratos IV team is currently tweaking the most recent version, the DHX-400 Nimbus engine, to make it ready to fly to space. Stratos II+ was the first rocket to implement a flight termination system, which can terminate the flight in the case of a flight anomaly. This allows us to keep building larger and more powerful rockets, whilst keeping it safe to launch. A flight termination system is now installed in every new generation of Stratos rockets. Its design is constantly being updated to meet the needs of the launch site provider. Rocket in the launch tower. 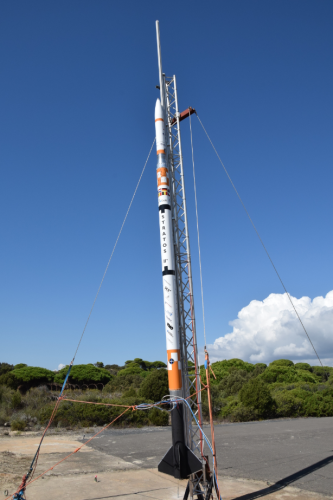 The launch of the Stratos II+ took place at the El Arenosillo test range in the south of Spain which is operated by the Spanish space agency INTA. This was the first time that we launched at this facility. Currently, we still maintain good relation with the launch site and we hope that we can celebrate another success together when we launch the new generation of rockets. The success of Stratos II+ ignited a new race to space, one where students are at the forefront. We hope that our next generation of rockets will be as inspiring. With the Stratos IV rocket we will continue to break new boundaries and further our quest to space. Time will tell if we can look back at its achievements as fondly as we do now with Stratos II+. Follow us on social media to keep up to date about our current progress!